In the investigation file, the following description can be found on page HA 09803: (Topic: Examination of the witness (Andreas Lubitz’s girlfriend) on 26.03.2015, here as “supplemental” to the initial interrogation). The girlfriend never made these statements! It appears in the file as a supplement to her interrogation and is not signed by her. This raises the question of why detective chief superintendent G. wrote it and placed it in the file. 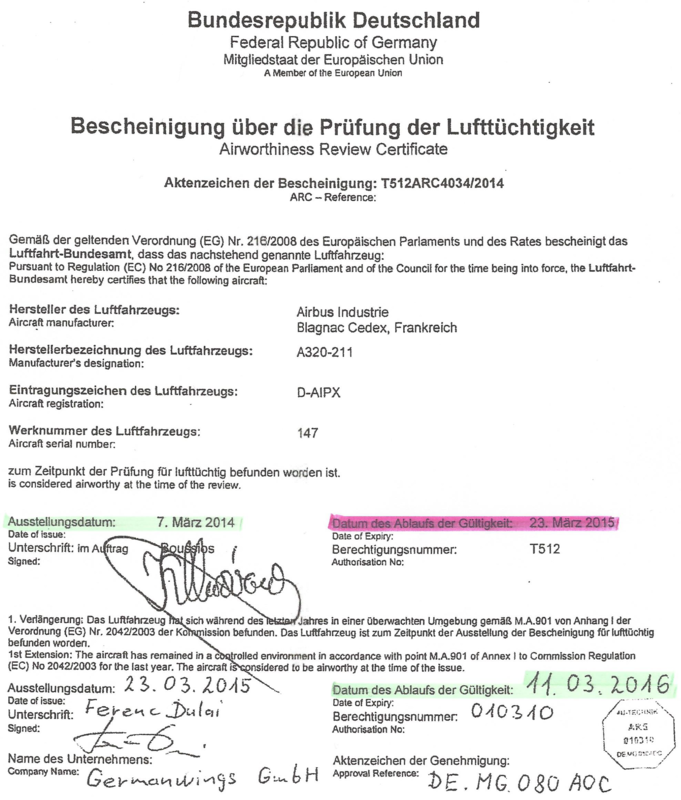 On 24 March 2015 Andreas Lubitz’s father was at a business meeting in Eindhoven, Netherlands, as evidenced by the minutes of that meeting. His wife telephoned him there about the Germanwings crash. At that time nobody knew for certain whether Andreas Lubitz was on that flight. Andreas Lubitz’s mother and brother drove together from Montabaur to Düsseldorf airport to determine whether he was on board. At Düsseldorf airport they were greeted by Germanwings / Lufthansa employees and a pastor, who are witnesses to their arrival. Mrs. Lubitz received the news that her son was co-pilot of the crashed machine and immediately telephoned her husband. He ended his business meeting and drove to Düsseldorf airport to meet his family. The girlfriend was at work at the relevant time, as colleagues can testify, and came later with her stepfather to Düsseldorf airport where she was also received by employees of the crisis team (also witnesses) and was taken to join the Lubitz family. After completing the formalities, the Lubitzes and the girlfriend with her step-father departed in their own cars, just as they had come. There was no shared ride to Montabaur! Nor did the girlfriend remove any items from Andreas Lubitz’s room in the family home in Montabaur. This fact alone is absurd, as she had lived with Andreas in their shared apartment in Düsseldorf for almost a year and it would be illogical for her to remove any items. Furthermore, she never entered the Lubitz home on the night in question. These absolutely untrue “facts” placed in the investigation file prompted relatives and their legal advisors to alert the press, who sensationalized false interpretations and conclusions and widely disseminated them to the public. All of the untruths were never corrected by the Düsseldorf Public Prosecutor, although we drew his attention to it. Why not? This entry was posted in All posts, False investigation results on 22. August 2017 by Autor.